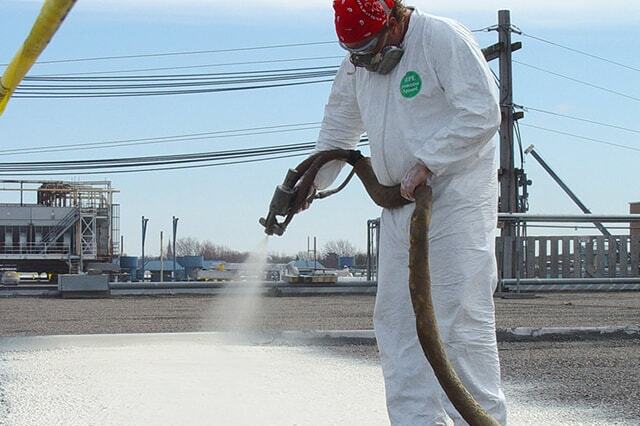 In this blog, we will be discussing one of our more popular roofing services for commercial buildings -- sprayed polyurethane foam or SPF, a combination of isocyanate and polyol. Plenty of benefits exist in terms of applying a foam roof from beginning to end, that is from purchasing to installing to building ownership post-installation. Skyline Roofing wants to start with the density of the foam material itself. Regardless of the type of foam material you're using, density is not something to be ignored. The thicker and denser the foam material is, the more protection you'll have. With that said, higher density translates to increased strength and higher R-value. R-value is a pre-determined rating that provides how strong the foam is against heat resistance. Therefore, a higher R-value means more resistance against the sun and heat. Most SPF roofs have densities between 2 to 3 pounds per cubic foot, for reference. Firstly, using sprayed polyurethane foam to solidify your roof can save money in a variety of ways. The cost savings are positively tied to maintenance. Since SPF roofs require less overall maintenance, naturally, the costs will be lower overall. A big second benefit is how the foam roof is constructed. Membrane roofs or metal roofs come in layers or pieces, depending on which type you decide on. On the contrary, foam roofs have no pieces. It's one continual coating. Why this is important is the protection factor. Your one-piece foam roof is protected against leaks and water intrusion more than any other roof type. Foam is the best route for sawtooth, arched, or any other unusual roof type. Thirdly, let's talk insulation. Metal roofs are great at reflecting the sun's rays and preventing trapped heat underneath from becoming hotter. Still, sprayed polyurethane foam beats even metal roofs. While no roof is bulletproof, you can count on the fact that sprayed polyurethane foam can actually be waterproof. Polyurethane foam is made up of billions of closed cells. These cells are so tightly packed together that there's no room for air or moisture to infiltrate, even at the molecular level. In case you were wondering, repairs may be necessary. Protrusions may need to be reinforced or added through ordinary building ownership. If it comes time to repair a piece of your roof, it will come down to spot treatment. You never have to replace a larger portion of the roof or the entire roof. It's a simple matter of taking care of the protrusion or repair and re-spraying on top of it. The bottom line is that with a properly installed sprayed polyurethane foam, you will endure very little maintenance. No roof is bulletproof, but foam ranks very low on the list for repairs. As with anything, proper care means the difference between a re-roof or one-and-done roof to last for several decades.